The Autonomy Project first began as a discussion in Cork, Ireland, in 2008 and developed into a long term research project in 2010.The rationale of the Autonomy Project was to re-vivify and re-invent discourses and possibilities of artistic autonomy within current artistic and curatorial practice. During the first meeting of the Autonomy Project it was proposed that the term Autonomy, if it were to be at all useful, should no longer be seen as a given or as a possible a priori state. Instead, the proposition became to view autonomy as the socially produced result of struggle and contestation for meaning. The Autonomy Project itself was developed around two interrelated strands. One strand was a series of events or Autonomy Schools which were organized by partner institutions. These gave an opportunity for undergraduate, postgraduate and early career artists, critics, theorist and thinkers to meet up and respond to issues surrounding autonomy. These Autonomy Schools resulted in a corresponding series of Autonomy Newspapers which invited Autonomy School participants to publish findings from, and responses to, the Autonomy Schools alongside the work of invited artists, critics, curators and thinkers. (This series is still on-going with a fourth and final Autonomy Newspaper planned). The second strand of the Autonomy Project invited a range of artists, critics, curators, philosophers and critics to address and think through some of the key themes and issues raised during the Autonomy Schools. This second strand also manifested itself through the Autonomy Newspapers and through an Autonomy Symposium which was held at the Van Abbemuseum in 2011. 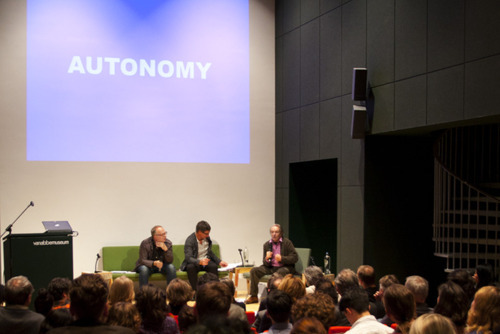 The Autonomy Symposium, which included contributions from Jacques Rancière, Thomas Hirschhorn, Franco Berardi, Hitto Steyerl, Tania Bruguera and Peter Osbourne also resulted in a special ‘Autonomy’ issue of the journal ‘Open’ in 2012. Charles Esche and Nikos Papastergiadis conduct an interview with renowned French philosopher, Jacques Rancière, based on questions from invited practitioners. Finally, ‘The Autonomy Reader’ is currently being edited for publication in 2014.